Blue Buffalo’s wide selection of wet foods all feature real meat and include only the finest natural ingredients. Flavors and recipes are inspired by home-style cooking to make a delectable treat for your canine companion and are formulated to support their health and well-being. Canidae recipes offer meat first for high quality protein with a texture your dog will love. Available in convenient serving sizes in a variety of flavors to keep your pet’s menu fresh. Earthborn Holistic moist grain-free dinners are excellent, high-quality protein sources for puppies and adult dogs. Each recipe is packed with wholesome vegetables and fruits, providing exceptional levels of vitamins, minerals and other essential nutrients needed for optimal overall health and nutrition. Your dog is sure to love one of the many savory flavors! Available in convenient 8 oz. resealable containers. Fruitables holistic pumpkin & sweet potato supplements are rich in dietary fiber, antioxidants, Vitamins A, C & E and provide a flavor pets love. These supplements are fortified with fruit & vegetable fiber, soothing herbs, and vitamins to naturally support food transition, digestive issues (like diarrhea), and weight loss. At Holistic Select, our unique grain-free canned recipes provide prebiotic support and feature botanicals such as pumpkin, papaya and pomegranate. These ingredients combined with our premium proteins help deliver optimum, natural nutrition for daily whole-body health. 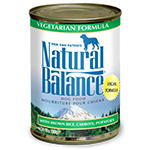 Natural Balance premium formulas offered complete balanced nutrition in a variety of delicious flavors – great for picky palates and dogs that have difficulty eating dry food. With Instinct, your dog will enjoy a hearty and nutritious diet, free of grains or fillers. Such quality nutrition provides beneficial proteins and balanced omega fatty acids to maintain toned muscles, healthy skin, and a glossy coat. NutriSource knows a healthy life leads to a long life. Tuffy’s Pet Foods, the maker of NutriSource & PureVita Pet Foods, has been manufacturing pet food for 50 years. Their products include nothing but the best ingredients for your furry family member. Their canned dog food recipes feature excellent palatability, digestibility, and taste dogs love. Dogswell, the makers of Nutrisca, strives to provide safe and superior quality products to help pets live long, happy and healthy lives. They carefully choose raw materials so that only the best, purposeful ingredients are in the final product. Each of their canned dog food recipes are crafted with simple, real food ingredients. Real meat, fish or poultry is the #1 ingredient. Recipes are grain and potato free and do not contain corn, wheat, soy, artificial colors, flavors and preservatives. ProPlan canned dog food by Purina uses meat as the first ingredient, is corn/wheat/soy free, does not contain artificial colors, flavors or preservatives and is formulated to be easily digestible. Redbarn Naturals Grain-Free Canned Dog Food is made from hand selected wholesome ingredients-fresh cuts of meat and poultry and garden vegetables all in a rich, delicious gravy. Tripett canned recipes are grain free and rich in essential fatty acids and digestive juices important for your pet’s health. Suitable for all breeds and all sizes, Tripett recipes are great for picky eaters, “Moms” – pre and post litters, and puppies – especially for when weaning from milk. Every natural Wellness CORE Grain-Free Canned Dog Food flavor features carefully controlled nutrient levels, ensuring your dog gets a complete and balanced meal for everyday feeding. Containing fruits, veggies and botanicals, these all natural recipes have no artificial flavors, colors or preservatives; giving your dog only the wholesome goodness he loves. Weruva recipes are formulated with the carnivore in mind. The calories required by a carnivore are those found in meat, protein and fat. The diet of a carnivore has minimal if any calories coming from carbohydrates. In that regard, dogs require or are obligated to eat protein and fat, but they do not need carbohydrates. Carbohydrates are not metabolically necessary. Weruva’s foods are formulated with the obligate carnivore in mind. We revolve nutrition around high quality protein, minimal carbohydrates, and high moisture content. Whole Earth Farms canned food formulas were created as a truly holistic food at a value price, without compromising the quality of your beloved pet’s food. We take the best, healthy ingredients from the earth and mix them into a delicious daily meal. With multiple protein sources, vitamins and minerals, Whole Earth Farms provides your dog with the best the earth has to offer. Like with all of our recipes, our recipes are made in the USA in our own kitchen and do not contain any ingredients from China.